Joseph L. Hartmann, Ph.D., P.E. On December 4, 2015, the President signed into law the Fixing America's Surface Transportation Act (FAST Act) (Pub. L.114-94). Section 1410 of the FAST Act amended 23 U.S.C. 127, Vehicle weight limitations—Interstate System, by revising the weight limits for certain vehicles on the Interstate System. The purpose of this memorandum is to provide guidance on maintaining compliance with the load rating and posting requirements of 23 CFR Part 650—specifically for the amended weight limits in 23 U.S.C. 127(r), Emergency Vehicles, for bridges on the Interstate System and within reasonable access to the Interstate System. Reasonable access is defined in a September 30, 1992 Non-Regulatory Supplement to 23 CFR Part 658 as at least one-road-mile from access to and from the National Network of highways, which includes the Interstate System, or further if the limits of a State's reasonable access policy for food, fuel, repairs, and rest extend to facilities beyond one-road-mile. Multiple presence: If necessary, when combined with other unrestricted legal loads for rating purposes, the emergency vehicle needs only to be considered in a single lane of one direction of a bridge. Live load factor: A live load factor of 1.3 may be utilized in the Load and Resistance Factor Rating (LRFR) or Load Factor Rating (LFR) method. Group 1: Bridges that meet any one of the following criteria do not need to be immediately load rated for emergency vehicles. an inventory rating factor for the HL-93 design load of at least 0.9 using the LRFR method. However, the bridges in this group shall be rated for the emergency vehicles when a normal re-rating is warranted, including changes in structural condition and other loadings. Group 2: Bridges not in Group 1 should be rated for the emergency vehicles following their next inspection to incorporate the latest condition of the bridge, but no later than December 31, 2019. Emergency vehicles should be included in any new load ratings for these bridges when the load ratings occur before December 31, 2019. If a State or Federal agency wants to utilize an alternative approach in lieu of the above to group bridges in an inventory for the purpose of prioritization, it should seek FHWA's review and concurrence of the alternative approach. Regardless of the prioritization approach used, the selection of load rating method should comply with FHWA's Policy Memorandum Bridge Load Ratings for the National Bridge Inventory, dated October 30, 2006. If a State law allows or exempts emergency vehicles to operate without restriction off the Interstate System as legal loads, 23 CFR 650.313(c) requires bridges on these highways to be load rated and posted, if necessary, for these vehicles. Unless State law relies on a different definition of emergency vehicle than that included in the FAST Act (23 U.S.C. 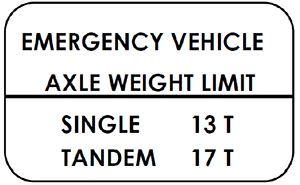 127(r)(2)), States can perform load ratings on these highways using the two emergency vehicle configurations included in this memorandum. Division Offices should work with their State DOT or Federal agency partners to develop an action plan by March 31, 2017, with defined tasks, completion dates, and progress reporting requirements. Although this guidance focuses on highway bridges, 23 CFR 650.513(g) also requires States and Federal agencies to load rate and post highway tunnels, if necessary. Therefore, the action plan should also incorporate highway tunnels. States and Federal agencies should load rate tunnels for the emergency vehicle configurations above by December 31, 2019. Each Division Office should coordinate this action plan with its Bridge Safety Engineer. We request that you share this memorandum with your State DOT or Federal agency partners immediately. If you have any questions or need more information, please contact Lubin Gao at (202) 366-4604 or Lubin.Gao@dot.gov, or your Bridge Safety Engineer.